IN THE FALL OF 1983 THERE WAS AN LA CITY WIDE STUDENT-PROFESSOR COMPETITION BETWEEN UCLA, USC, CAL POLY POMONA AND SCI-ARC WITH DIFFERENT SITES ACROSS DOWNTOWN LOS ANGELES. OVER THE YEARS AT SCI-ARC I HAD RUN A SERIES OF PROJECTS THAT DEALT WITH ZONING. OUR CITIES ARE PRODUCTS OF ZONING LAWS. WHAT IS LACKING ARE ZONING LAWS THAT PRODUCE VIABLE CITIES. DEVELOPERS, BUILDERS, AND ORDINARY PUBLIC BUILD WITHIN THE RESTRAINTS. WHEN I WAS DESIGNING IN 1969 AND 1970 FOR DEVELOPERS, I WOULD FIGURE OUT THE MAXIMUM AMOUNT OF VOLUME AND UNITS THAT I COULD GET ONTO THE PROPERTY AND HOW THE BEDROOMS COULD BE BROKEN AWAY TO MAKE MORE UNITS.. THE LAND WAS EXPENSIVE AND THE DEVELOPER WANTED ALL HE COULD GET. I FELT THE UNITS WERE INTERESTING AND CONTROLLED BY TYPE FIVE WOOD CONSTRUCTION THAT WAS LIMITED TO TWO STORIES. I WAS TOLD THE BUILDING DEPARTMENT KEPT A MODEL OF WHAT MY TWO STORY CONSISTED OF. IN REALITY IT WAS FIVE STORIES HIGH, THE LAW ALLOWED TO BUILD UP GRADE ON THE SIDE YARDS, TO BURY THE PARKING ON GRADE AND HAVE MEZZANINE LEVELS THAT WERE 1/3 THE FLOOR AREA OF THE ROOM THAT THEY WERE OPEN TO AND ACCESS TO A SPLIT LEVEL ROOF. I COULD JUST AS WELL HAVE BEEN DESIGNING WITHIN A SET OF CRITERIA THAT PRODUCED ROOF GARDENS, RECYCLING OF WATER AND GARBAGE, SOLAR ENVELOPS, FOLIAGE GREEN WALLS ETC. THE SITE, THE OLYMPIC PARK AREA WAS AN AREA OF LOS ANGELES THAT WAS A TYPICAL GRID IRON STREET PATTERN THAT IS FOUND THROUGHOUT THE UNITED STATES. IT WAS SELECTED FOR ITS LACK OF CHARACTER AND UNIMPORTANT CONTEXTUAL BUILDINGS ON THE SITE. ALSO IT OFFERED A CHANCE TO BE IMPLEMENTED IN OTHER PARTS OF THE CITY AND OTHER CITIES. I HAD A GROUP OF EIGHT STUDENTS TO WORK WITH. I BANGED OUT THE CONCEPT INSTANTLY I PICKED THE FUNCTIONS AND THE PATTERNS OF VISUAL GAME FOR EACH BLOCK. THE STUDENTS WERE INVOLVED AS DEVELOPERS WORKING WITHIN THE CONFINES OF THE ZONING THAT I SET UP. THE SITE WAS FOUR BLOCKS , THAT CREATED ONE LARGE RECTANGLE GROUPING. MY CONCEPT WAS TO CREATE A SOLAR ZONING ENVELOPE FOR HIGH DENSITY DEVELOPMENT THAT INCLUDED ECOLOGICAL AND MOVEMENT SYSTEMS. ALL HERE AND NOW STUFF THAT COULD BE BUILT. RALPH KNOWLES A PROFESSOR AT USC HAD DONE ELABORATE STUDIES OF SOLAR ENVELOPES THAT THE SOUTHWEST INDIANS HAD INCORPORATED INTO THEY’RE BUILDING GROUPINGS. HE USED THIS AS INSPIRATION TO DEVELOP PRESENT DAY COMPLEX SOLAR ENVELOPE PROPOSALS. I IN CONTRAST WANTED A SIMPLE SOLAR ZONING CODE THAT DEVELOPERS AND PLAN CHECKERS COULD UNDERSTAND AND WORK WITH. LOS ANGELES DOWNTOWN IS LAID OUT ON A SPANISH GRID. THAT MEANS THAT ONE CORNER OF A BLOCK DIAGONALLY FACES SOUTH. THE THINKING BEING THAT ALL SIDES OF A BLOCK WOULD GET SOME SUN EVERY DAY MOST OF THE YEAR, BUT THE SOUTH CORNER WOULD GET THE MOST. THEREFORE I MADE THE SOUTH CORNER THE HIGHEST. WORKING OUT TO OVER 20 STORIES AND BOTH SIDES TAPERED DOWN TO 3 STORIES. I THEN DREW A DIAGONAL LINE IN PLAN TO THE TWO LOW CORNERS. THE CONTROLLING HEIGHT OF THE SOUTH CORNER WAS A 28 DEGREE SLOPE TO THREE STORIES. THE RESULTING SOLAR ENVELOPE LOOKED LIKE A THREE SIDED PYRAMID. WITH THIS CONFIGURATION THERE WERE NO SEVER SHADOWS CAST ON ADJOINING PROPERTIES AND THE SLOPING ROOF OF 28 OR LESS DEGREES RECEIVED SUN ALL YEAR AROUND. THE STREET FACADES WERE VERTICAL AND HAD CRASS COMMERCIAL SIGNAGE. A HEIGHT LIMIT OF 30 FEET WAS ALLOWED ON ALL SIDES OF THE BLOCK. THE ROOF WAS TO BE PLANTED GREEN AND HAVE PUBLIC ACESS OF WALKWAYS. GREY WATER WAS PUMPED TO THE ROOF AND CASCADED DOWN TO PONDS OVER EXPOSED RIPPLED SUN EXPOSED SURFACES FOR PURIFYING. THUS THE TERRACED ROOF PLAN BECAME A PEDESTRIAN MOUNTAIN THAT THE PUBLIC COULD CLIMB. A COMBINED USE OF TWO BLOCKS TOGETHER ALLOWED FOR A HIGHER SOUTH CORNER. A LARGE INTERIOR SPACE LITE FROM THE ROOF AND A LARGE PARK ON GRADE. THE ONE BLOCK SCHEMES RESTRICTED THE HIGH POINT TO TWELVE STORIES. THE PROPOSED USES WERE HOTELS, COMMERCIAL MALL SPACE, OFFICES, MARKETS AND GYMNASIUM. THE EXTERIOR ROOFS BEING FOR TERRACED HOUSING AND OFFICES. THE INTERIOR PARKS OFFERED PUBLIC STROLLING AND SENIC VIEWS FOR RESTAURANTS ETC. 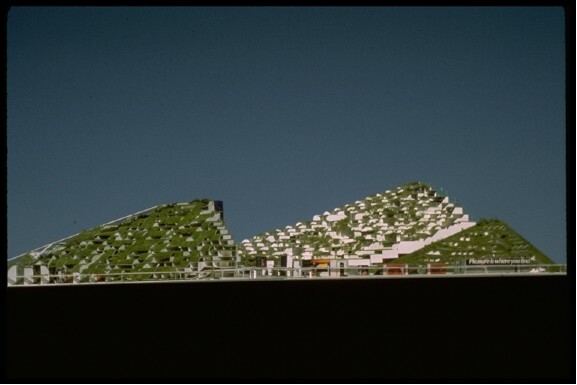 THE DOWNTOWN PATTERN BECOMES A SERIES OF SLOPING GREEN MOUNTAINS WITH MIXED USAGE OPERATING 24 HOURS. A RAISED PEDESTRIAN WALKWAY HOVERED 15 FEET OVER THE EXISTING SIDEWALK THAT DARTED INTO BUILDING AND PARK COMPLEXES. IN PRE CAR ENGLAND, WHERE ROADS HAD BECOME TOO MUDDY FOR PEDESTRIAN CROSSING. RAISED PEDESTRIAN WALKWAYS WERE USED FOR PEDESTRIAN CROSSINGS OVER BUSY HIGHWAYS. TODAY THE MUD IS A BUNCH OF DANGEROUS TRAFFIC THAT IS IN CONFLICT WITH PEDESTRIAN CROSSING. WHAT TURF TOWN USED WAS A SYSTEM OF RAISED PEDESTRIANS THAT FOLLOWED THE EXISTING SIDEWALKS IN A LOGICAL MANNER. THE BEAUTY OF THE GRID IRON CITY PLANNING IS THE EASE OF KNOWING WHERE YOU ARE. 5TH AND MAIN ETC. A LOT OF PEDESTRIAN CROSSINGS HAVE BEEN USED IN MODERN CITIES, BUT USUALLY IN A CONFUSED MANNER. ESPECIALLY IN LOS ANGELES. THE EXISTING STREET LEVEL BEING FOR CAR AND TRUCK ENTRANCES AND DROP OFFS AND BUILDING ENTRANCES. THE RAISED PEDESTRIAN LEVEL ALLOWED FOR SAFE UNINTERRUPTED MOVEMENT WITH CONNECTION TO LOBBIES AND TERRACES AND COURTYARDS. THE PARKING WAS MULTILEVEL UNDERGROUND WITH LITE SHAFTS FROM THE STREET EDGES AND PARKS ABOVE. THE RAISED PEDESTRIAN LEVEL DOUBLES STREET FRONTAGE OF SHOPS. A COMMON PRACTICE IN SHOPPING MALLS. SOMETIMES THREE AND FOUR LEVELS. BESIDES THE STREET LEVEL TRAFFIC I PROPOSED A SUNKEN EXPRESS LEVEL ROAD 15 FEET DOWN.THE PEDESTRIAN LEVEL MAKES FOR A GREEN CONNECTION OF MECHANICAL SERVICES AND WATER COLLECTION. A NATURAL FOR GROWIES. IN THE LA INFRASTRUCTURE COMPETITION IN 2009 I SHOWED THE LITE RAIL ABOVE THE PEDESTRIAN LEVEL, A MECHANICAL SERVICE LAYER BELOW THE EXPRESS WAY AND THE SUBWAY BELOW THAT. ALL A BIT MUCH TO SANCTION. MY LATEST PITCH IS TO DO MY OWN VERSION, IN A SIMPLIFIED MATTER, THAT ANY DUMMY CAN UNDERSTAND AND REALIZE IT IS CHEAP , SAFE, PROFITABLE AND A TRAFFIC JAM SOLVER. THE WORLD LOVES THE CAR, RATHER THAN TRYING TO ELIMINATE THE AUTO MAKE IT BETTER AND CITY FRIENDLY. (ANOTHER ARTICLE) IF ANYONE HAS A CONNECTION TO THE AUTO WORLD I WOULD LIKE TO TALK TO THEM ABOUT SPINNING THE POSITIVE. THE CITY PLANNERS ARE OUT TO ELIMINATE THE CAR. I TRIED THE RAISED PEDESTRIAN LEVEL IN 1988 OLYMPIC WEST COMPETITION. I DID IT AGAIN IN 2006 AT THE UNIVERSITY OF OREGON WITH A STUDENTS URBAN PROJECT IN DOWNTOWN EUGENE AND A PROFESSOR OBJECTED THAT THIS IS ONLY APPLICABLE TO HONG KONG HIGH DENSITY. HE TOTALLY IGNORED THE IDEA OF A LEISURELY SAFE PEDESTRIAN MOVEMENT , BICYCLES, AND HANDICAP VEHICLES. 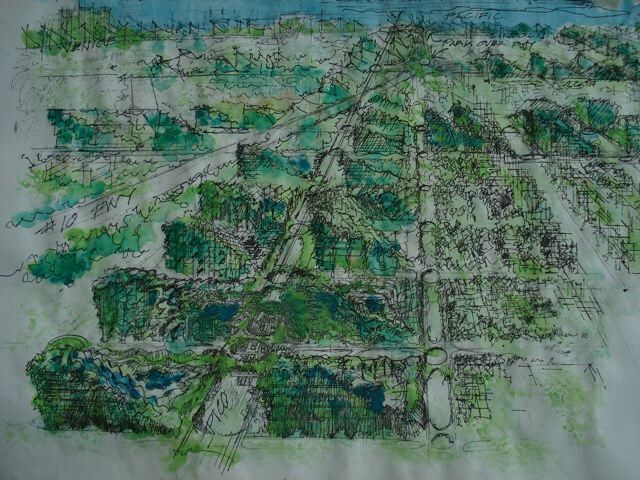 WITH 15 UP AND 15 DOWN IN 2009 LA INFRASTRUCTURE COMPETITION I WENT ALL GREEN AND COMBINED ALL THE MOVEMENT SYSTEM OF LA. IN SPRING OF 2010 AT THE ACADEMY OF ART UNIVERSITY STUDENTS TURNED IT INTO A SPONGE DESIGN PATTERN TO TIE THEIR SCULPTURAL BUILDINGS TOGETHER. IN FRUSTRATION I ENDED UP BUILDING A LITTLE MODEL OF HOW IT SHOULD WORK WITH THE THEIR PATTERN. I UNDERSTAND NEW YORK HAS A RAISED PARK CALLED HI-LINE, THAT IS A BIG TIME HIT. THIS SHOULD BE AN INCENTIVE TO BUILD A RAISED PEDESTRIAN LEVEL. THE 4 FOOT BY 6 FOOT MODEL SAT IN THE LA SCIENCE MUSEUM FOR TWO YEARS AND ON LA CITY PLANNING FLOOR FOR ANOTHER TWO YEARS. I NEVER HAD ONE CALL OF INQUIRY. IT SEEMED SO OBVIOUS AND CORRECT FOR DEVELOPMENT. AND YET ITS TIME HAD NOT COME. ARTHUR ERIKSON BUILT GOVERNMENT AND APARTMENT BUILDINGS IN VANCOUVER WITH TERRACED ROOF GARDENS. NOW EVERYBODY IS CLAMORING TO DO ROOF GARDENS. 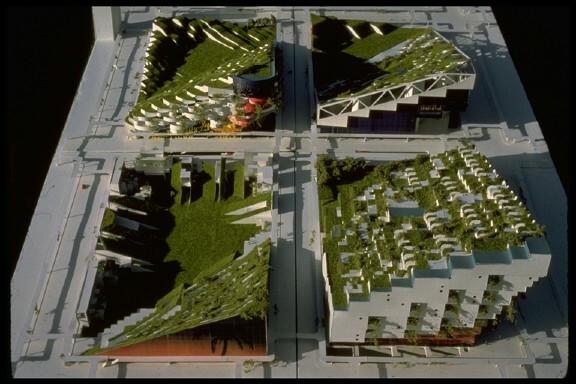 RECENTLY IN COPENHAGEN DENMARK, A GROUP OF BUILDINGS CALLED MOUNTAIN DWELLINGS BY BJARKE INGELS GROUP ARE BEING BUILT. NOT THE HOLISTIC VERSION I PROPOSED, BUT A START. TURF TOWN IS THE COMBINING OF MANY URBAN SCALE CONCERNS. DIFFICULT TO COORDINATE WITH SO MANY VARIED INTERESTS VYING FOR THEIR SAY IN OUR DEMOCRATIC PLANNING PROCESS. MAKE OUR EXISTING CITES WORK. THE PROBLEM IS THE MINDS OF PLANNERS CONTROLLING OUR CITES ARE LIMITED TO DOWN RIGHT STUPID. ARCHITECTS JUST LEAVE THAT STUFF TO MUNICIPALITIES AND RETREAT INTO THE SAFE HAVEN OF ANOTHER BUILDING ON A SITE IN A BLOCK. OH YES WE GET GLIMPSES WITH NEW DEVELOPMENT OF WHOLE TOWNS, BUT THAT DOES NOT DEAL WITH THE EXISTING CITES. Great piece Glen. The Mountain Dwellings in Denmark look just like Turf Town, thirty years later. THE DIFFERENCE OF TURF TOWN AND THE NEW STUFF IS THAT IT IS NOT ALL THAT NEW STUFF IS NOT THAL ALL RELEVANT, LACKING AN URBAN CONNECTED SYSTEMS OF GREEN, PEOPLE, AND COMMERCIAL. IT WILL TAKE AWHILE, BUT THINK BIG IS THE ANSWER.